Build Their Skills – Handwriting Cursive, Traditional Style, is an effective resource for teaching cursive handwriting skills. Meaningful exercises will interest students as they practice their handwriting. This activity book may be used for instruction, independent classroom activities, homework assignments, reinforcement of hand writing skills, tutoring resource, home schooling tool, and enrichment activities. 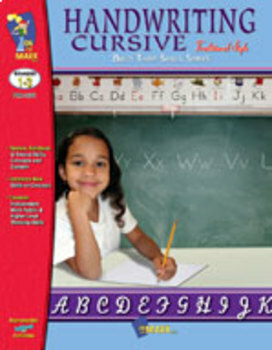 This book provides practice writing cursive in the traditional style in creative ways. On each page, children will practice writing the focus letter, a word associated with that letter, and then a sentence. Dolch sight words are included on each page. Dolch sight words are among the first words children learn, many of which either can’t be sounded out or can’t be illustrated. Use of these words reinforces reading and writing skills. The theme of the page is continued in a meaningful writing exercise that generates interest and further develops critical thinking and language skills. The activities are designed to be interactive and relevant to children’s lives. Our crew of sailors give out the instructions, so children can also use this book at home with their parents; together they can follow the instructions. The child can begin at the starting point and off on a journey they’ll go! Always encourage children to do their best and avoid reprimanding a child for messy writing. Children will experience the greatest success with handwriting if they enjoy the learning process and want to foster their own skills. Happy sailing – happy reading – happy writing!